Home to 149 guest rooms and suites, an indoor water park, two elegant ballrooms and onsite dining at Wildwood Sports Bar & Grill, the Apache Hotel is a fine choice in Mayo Clinic, MN hotels. 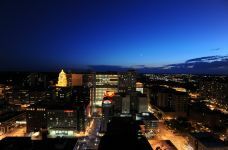 Browse our gallery to view our rooms and onsite offerings and plan your stay at our Rochester, Minnesota hotel near Mayo Clinic and various attractions near the downtown area. We look forward to your stay.